When your windows leak, this is the place to start! Mark Meshulam is an window consultant and glass consultant. He investigates window leaks and wall leaks and performs window water testing. [audio:http://chicagowindowexpert.com/audio/mywindowsleak.mp3|autostart=no]If your windows leak, you have a problem much greater than the appearance of water when it rains. Water leaks damage your property and can lead to mold, so your quick action to fix this problem will be very important. The problem is that water leaks in buildings is a complicated subject and each leak is unique. You may need an window consultant to assist. If windows leaks when it is not raining, the water could be condensation. We have a different article for that. 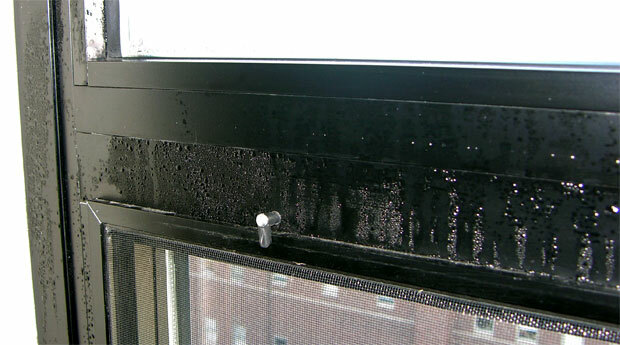 It’s called Window Condensation: Top 10 Fixes It might be that your humidity is too high. Window condensation appears as beads of water on the face of the window, and typically occurs when the temperature suddenly drops. Do you know any reliable company I can get help in California? I have a roof leak, interviewed about 7 companies, hired 1 to do the job. they put in new roof – remove concrete tiles, put in new flashing at valley area, put in new felt paper, but did not fix the leak. when it rain, under neath window is still wet. used to have marching ants all over my bay window. company came out and apply more asphalt on the side of the roof tiles, problem is still there. please help! Very sorry about your roof leaks. I know California has been getting a lot of rain lately. If your problem is beneath the windows, it is probably in the wall and /or window, and not the roof. First check the caulk around the window, Send me some pictures and I will try to help. I can help you with your window leaks even if I am in Chicago and you are far, far away. I have already helped countless people who sent in descriptions and pictures of their window leak problems. Send pictures with interior and exterior views of your leakage area along with a larger picture of the building. If the leak is on the top floor of the building, a picture of the roof above the leak area will also be very helpful. I have a leak that has just started. It is originating between the head jamb of the window and the top wood trimming which immediately abuts it. The water droplets are coming from the top between them and not from any part of the window itself as I can see. I’m assuming that this is a roof problem rather than the window since no moisture or droplets are coming from any part of the window itself. I live in the East Coast, Western PA, and we’ve had tons of snow which is probably attributable to this problem (immense accumulation of snow is on the roof). I was wondering what your thoughts are on this? Yes, my friends at Traco have been telling me about the crazy amount of snow you have had. They are in Cranberry Township, just outside Pittsburgh. 1. The caulk at the exterior top of the window may have failed. 2. The wall construction above the window may have developed a leak. This could be a lintel flashing in a masonry wall or a siding flashing in a frame construction. 3. Higher up, it could also be the roof, but since the leak is at the edge of the building, and not in the middle of the roof, this indicates a problem in how the roofing is terminated at its edges. If the problem developed after heavy snow, this may be your scenario: Snow piled high not only on the rood but also on the gutters, creating a condition where the edge of the roofing was immersed in snow. All you needed was a little warming to turn the snow to water. If the melting occurred closest to the roof, the snow could capture the water, creating an invisible swimmimg pool under the snow. Now the edge of the roof is immersed in water. Roofs are not designed for immersion. They function by “shedding” the water. During immersion, the water can go uphill and find its way under shingles and through seams and nailholes in roofing paper. This problem may not recur until your next major snow. The solution is to have your roofer redo the bottom edge of the roof by removing the lowest few courses of shingles, and running a self-adhesive rubberized membrane such as “Ice and Water Shield” along the edge, being sure to get it as high as is normally successfully done in your area. I live in a 12 story brick building from the 1950s in Brooklyn, ny; we’re getting washed away in rain for 2 days now; my bedroom windows as slightly ajar when the rains came today, but i closed it of course when i got home. Later in the day i noticed water pooling on the window sill, i dried it and noticed it kept coming; the water is coming in from the bottom right corner of the window frame where it meets the wall and sill – the whole corner is wet. i am at the mercy of building maintenance as it is a coop that i live in; until they can do something, pls. let me know how i can help myself; it is my first home that i own and am freaked out that my little apartment is getting this potential bad damage; I am on the second floor but i haven’t got a way of getting on the outside of my window to check the caulking. thanks for any advice and help. it’s great to have found you on the web. So I’m wondering why my cat is acting really weird in my dining room last night- only to walk in and see the drip, drip, drip coming from the top of my window as shown in the “water stains at top of window” picture above (one drip every 15 seconds or so). It had been raining quite hard for a few hours prior and usually that is not the side of the house to “take on” the weather; the wind direction was unusual to say the least. In any case, it was the first time I noticed the problem even though it appears from what seems to be a previous SMALL stain that it has happened before. Being in the Buffalo, NY area, the house was Tyvek wrapped when built 9 years ago so that should help abate water, correct? The windows are vinyl clad single-hung low E MW windows. I’m having an issue with it being a window defect as well as a possible building defect above the window. This is a first floor window and my bedroom window is directly above it with no issues. Long story short- I’m leaning towards simply recaulking the exterior perimeter of the window. Is that a bad idea in any way? Is there something I should maybe be looking for- or doing prior to- recaulking? I don’t want to seal “IN” a problem. Hi Mark – great article and very timely as we are getting pummeled by rain this weekend. I noticed some water leakage around one of our windows this week, and would love to get your perspective as to whether this is a window, or building issue. We live in a condo and have found out that much of the gut renovation work was not great. Is there any chance you can take a look at some pics and offer some thoughts on what work might need to be done? Also, do you know of any good window guys in Boston? Feel free to send me pics – I will be happy to help. The symbiotic nature of man’s relationship with animals is striking in your touching story. Tales of Lassie awakening her slumbering owners to save them from a burning house are well known, even commonplace. Your tabby has ratcheted such stories to the next level. Now we have a cat who detects window leaks! Levity and admiration aside, your idea to start by replacing the exterior caulk at the top of the window is a good one. If there is brick above the window, try to avoid sealing the space between the top of the steel lintel and the bottom of the brick. But by all means seal from bottom of lintel to top of window. You might also go upstairs and recaulk the sill of the window above. Just avoid sealing over anything that looks like a drainage or “weep” hole. These sometimes occur at the bottom of windows. Let me know how it goes. Good luck and may your cat arrive at a more peaceful place. Those rains in the Northeast must have been a doozy – ChicagoWindowExpert.com got 250 hits from New York and New Jersey last weekend. Congrats on having your first place, and don’t freak out about the leak. What people can screw up, we can also usually fix. You did not mention the type of window: aluminum, wood, steel or vinyl. But you did mention that you could open the window. If you can open the window, look at the seal between the side and bottom frame. It should be sealed fully front to back, with this seal marrying in to the exterior perimeter sealant. If the sealant is not visibly present, invest in a tube of 100% silicone caulk – your choice of color – and seal this location after first sealing with isopropyl alcohol, then with a dry rag. Be sure to tool the caulk (similar to frosting a cake) to get good adhesion. While the window is open, peek outside and see if the exterior caulk is ok. Send pics if the condition persists. Good luck! We received a ton of rain this past weekend. Our new bay windows (main floor and directly above on the second floor) all leaked. They leaked below the window frame (on the drywall) where the smaller window meets the large center window…in all 4 corners! The contractor who replaced the windows (when we had NO leaks) is saying that it is a roofing issue. Is it possible for there to be a roofing issue to cause leaks in ALL 4 corners? How is that possible? Please provide any advice you can offer…my $12,000 is new windows is costing me my sanity. Thank you for your website. I will continue to read it to see if I can understand the building construction so I can converse with the contractor with a small degree of intelligence. Very sorry to hear of your problems. Would it be possible to send me a few pictures so I can make a better guess? Without the pics, I will say that it is highly unlikely that the roof suddenly leaked at the exact time the new windows were installed. If the rains are worse than ever before, I suppose it could happen.. I saw your blog about Chicago windows – and more specifically, the post about leaks. I was curious if you provide services in residential settings as my wife and I have been experiencing leaks in our master br windows (through the frame, actually) and aren’t sure how to best attack the problem. We’ve guessed that it might have something to do with our facade as it juts out from the house a bit, leaving a natural separation point for water to enter, but of course that’s just a guess. As we head into spring and summer rainy season, I wanted to start addressing this asap. Yes I have a special deal for residential clients. Call me and we can discuss. I have been preparing to submit a warranty claim for seal failure in Crestline “Select” Aluminum Clad (Low-E, argon-filled) windows of a house that we built for ourselves in 2006-2007. Seal failure was obvious in the eight windows that had condensation between the glass panes this winter. Most, but not all, of those eight also exhibit permanent cloudiness and swirl marks between the panes. Now, I have noticed that five other windows that did not exhibit condensation do have distinct spots and hash marks/lines between the panes of glass. The marks are most visible from the outside and are quite distinct, not cloudy. Does this type of mark (without condensation) still result from seal failure? Or, does this sound like a defect in material and/or workmanship? Is there an industry term-of-art for this type of defect? I hope the answer is obvious to a window expert and doesn’t require your crystal ball. Any input will be much appreciated! Sorry about your window problems. Seal failure’s most noticeable symptom is actual moisture between the panes, however, another symptom can be cloudiness. This occurs when moisture attacks the low-e coating, which is metallic. I would have to see the spots and hash marks you describe. My crystal ball doesn’t have that as a typical occurrence, and I don’t want to speculate. Is there any way to get a picture of this and send it along? To learn more about insulated glass failure, go here. I’m sorry to be so slow in getting back to you. Photos will follow by email. Thanks for your help!! I am experiencing the same exact problem that you described above. Leak at bottom of window. This window is on the 2nd floor and due to the leakage, the water penetrate through the dry wall to the window on the first floor. I poured a glass of water to the bottom of window and I can see water drain out. But I afraid that not all water have drained out and some leak into the dry wall. You mentioned that we need to seal the sill and jamb of the window. Any recommendation of what type of sealant will work? Also, how can I prevent from sealing the draining holes too? I have had a window leak (?) for years now. I had the windows replaced several years ago and the problem did not go away. Then I had the roof replaced. A month later, the siding and gutters. I have had several people come and tell me I needed caulking, (atfer spending money on the roof and siding), but the problem still exists and is spreading. At first it was just one wall under a window. Now the wall in my bedroom is deteriorating. My worry is that I will again spend several thousand dollars only to find the problem is not resolved. Are you with an actual company that performs the work? If not, can you suggest a relaible and affordable company? Without seeing the condition, generally 100% silicone is the best sealant for most applications. Weep holes tend to be visible, so avoid sealing holes which look purposeful and are located at the lowermost point of a sloped sill. Send me a few pics and I will respond further. Yes I am with an actual company and I do house calls. Please call and we can talk further. Single family residence, Georgian two story, Bay window, Southwest Chicago, moisture and black coloring at bottom inside corners of all four casements, middle two fixed. Ice formed at inside sill and window frame seam this winter. No visible signs of a leak. Window 9 years old. Any suggestions. Hi. We had windows installed in our home many years ago (maybe 10) and have always had a problem with leaking. The window sills are always wet after a heavy rain and the paint becomes cracked and chipped. A number of years ago, we called to complain and the company replaced the windows. However, this has not alleviated the problem. Can the leak actually be stopped or does it require a replacement of the windows? Yes, Jeff, I believe you are correct. The center mullion of the windows is your most likely culprit. The windows look as if they are engaged into a separate mullion piece. The installers (or factory if they are factory mulled) must bed these engagements in sealant fully, so that the sealant squeezes out the front, so it can marry with the perimeter joints. Your posting also mentioned latex caulk. See if you can find a silicone that sticks to the vinyl. The other areas you circled in your pictures can also be suspects, but the mulls are by far the most likely causes of the leaks. After walking into my daughters room to get her out of her crib today i found the window was leaking. I am including some photos to hopefully help you better let me know. I called the 24/7 maintenance and she came too look and told me its because the ice in the gutter is preventing the gutter from doing its job so the run off is coming into my daughters bedroom? The problem being that in two hours the paint is already bubbling around the window seal and the Carpet is completely soaked leaving it to be an unsafe condition for my daughter to be in so she is temporarily in my room with us. Bubbling Paint after just two hours of leaking? The guy who diagnosed an ice dam in the gutter was on the right path. When ice builds up in the gutters, it can create a pool where the lower edge of the roof is immersed in water, The water runs under the shingles and you can get a sudden gush into the room. Maybe you can get someone to drape heating wires onto the gutter and roof edge to melt the ice and establish proper drainage. In the spring, the bottom courses of shingles must be removed, and a rubberized sheet (one product is called “ice and water seal”) is then placed in the area. You seem to have the same problem as Emily (see above). The big clue is that the leak occurs at the top of the window when snow melts, not when it rains. Step one is to melt the ice dam if possible. and have someone lay it in the gutter to melt the ice. Later, after spring showers, have the lower 3′ of your roof re-done with a rubberized membrane beneath the shingles, such as Ice and Water Shield. Use a roofer who has good references doing this kind of work. They will need to securely tie the membrane to the gutter to ensure the water doesn’t creep between roof and gutter. Mark, thanks so much for the quick response and useful information! Not sure if I could get any roofer to de-ice my house (I have a colonial, gutter is pretty high up … with feets of snow around my house it makes things more difficult). Since it’s not big leak, do you think we can wait until weather is nicer, or you think we should get this done asap? My house is about 10 years old. Do you think I should have a general contractor to check roof, gutter and windows when spring comes? How often does home maintenance need to be done? Thanks again! You won’t know if you can get a roofer or handyman to install the de-icing wires unless you call around. With things being so economically tough, there may be a line of people willing to do the work. Just make sure they have insurance! I really don’t know if you can wait to stop the leak because I don’t know how much water is coming in or the degree of degradation of the materials that are getting wet. It is worth removing some drywall and looking inside to see how bad the story is. If it’s getting bad, you should take some kind of action. If you do remove some drywall and can see that the drip is at a localized point, see if you can catch it with a bowl or somehow drain it until the spring comes. You can be “green” and pipe the water into your flower pot. We already know that you will need roof/gutter work this spring, so find a roofer you trust and get advice on general maintenance of these areas. If they know anything about caulk, have them check the caulk around the windows, too. Called my cousin and gave me contact info to a reliable and experienced roofer. He would be over within next few days (too many roofs to fix now). Appreciate your help! 1. Bay windows on the first floor started leaking badly during a big storm on Christmas Eve 2009 in Chicago. Water coming down at the wall side. A contractor came over to tear off the dry wall underneath the bay windows so we can see where the water comes from. 2. The contractor detected the problem as the caulking of the 4 second floor windons above the bay windows. He re-caulked the windows upstairs and the outside of the bay windows and solved the biggest problem. 3. Still water dripping at 2 spots in the middle of the bay windows (between the 2 small windows on the second floor) and behind the bricks when it rains very hard and for a long time. The contractor cannot pinpoint the location of the leaking. He checked the roof, the shutter and they look fine. 4. One day after a big storm, the contractor came and found water around the gasket at the bottom of a second floor window and the night before the leaking was under that window. He said the gasket of the window was bad and the water got in from there and leaked to the first floor. We called Anderson window and they sent us parts and sealant for replacing the gaskets. 5. We tried to contact an Anderson Window contractor to replace the parts for us but did not get reply. We called the contractor but he did not reply either, not sure if it’s because it’s still winter and they don’t work on outside of the house yet. 6. Anyway, we would like to have an expert to see our situation and will probably need to get you to fix the problem for us if possible. We hope the problem can finally be solved and the dry walls can be put up again – the house has been messy for over a year now. I had pella windows put in by a general contractor last year. We have a leak in one of the windows. The contractor says the issue is rotted wood and flashing but would like to get your opinion. The window is in the master bedroom which is in the front of the house. The leak, which is more like a stream, comes from the top between the window and the pane. The leak usually happens when it rains hard. The caulking on the outside of the window seems to be fine. Water pipes. Inspect the water pipes connected to your water heater. If you find the leak is coming from your pipes, tighten the fitting where water is escaping but be careful not to over-tighten. If tightening does not work, you will have to replace the fitting. The photo above showing the yellow arrow where the sill and jamb of the window should have been sealed to one another, but were not…looks like my problem. My windows are less than 5 years old and I’m having a hard time getting the window installer out to assess the problem…what is the fix when it appears that the seal and jamb are not sealed? I need a better description in order to help you. Send a few pictures to Mark@ChicagoWindowExpert.com. Take one shot from the inside of the entire window, a close-up of the leak on the inside, and a view of the entire side of the house on thee exterior, all the way up to the roof. This is great info on identifying a leaky window and getting it fixed. Another thing to consider is getting replacement windows installed in your home which will also give you an additional tax credit and keep your home warmer in the winter. Last year we made the mistake of pouring stone / cement into a window well so that we can extend our porch. Now when we get a hard and fast rain this window leaks and we get about 1 quart of water in our unfinished basement. We tried pitching the driveway, ensured our gutters are away from the house and extended down the driveway but these things did not help. We are now thinking of replacing the window with glass bricks or ceramic bricks. Do you think this would solve our problem? Any suggestions would be great. I just bought a house 3 months ago that I’ve come to discover has window leaks. It looks just like picture/scenario #4 where the leaks seem to be coming in from the bottom. The outer corners of the wood windowsill are rotted from water damage and the drywall around these sill corners also appear to be water damaged. The telltale signs of water penetration was actually from water that appeared to have run down the corners and settled on the baseboard heater. Do you have any ideas how to remedy this? Do we need to replace all of the windows (as there are 3 windows that are really bad but the rest of the windows all seem to have similar problems along the corners to a lesser degree). I would greatly appreciate any advise you can give me regarding the matter. Hello. We had a leaking transom window on the 2nd floor of a 3 story home (built in 2007). We had a contractor who works full-time for a major window manufacturer (and does side work on personal time) inspect and recaulk the windows (there were multiple cracks around the entire window), only for it to continue to leak shortly thereafter. He removed the interior trim so we could watch and pinpoint the exact point of entry with the next rain. Unfortunately, that contractor injured his knee and wasn’t able to help us remedy the issue. So we called several general contractors who were all perplexed as to where the rain was coming in. I insisted that it was coming from the top of the window and asked them to take the hose to the attic and spray it down on top of the window. Sure enough, the water came pouring in as if there was a huge opening and nothing at all stopping it from coming in. That led to speculation that it was the drip cap. After getting three quotes from reputable companies with lifetime warranties, we settled on one and had the vinyl transom replaced with a new one yesterday. We were under the impression that the drip cap would be replaced as well but the installer inspected it thoroughly and said it seemed intact and fine. He ended up recaulking the back of it as an extra precaution although he said the existing caulk did not appear to have any cracks in it. My concern is that the drip cap no longer extends over the window since the bottom sill from the replacement window juts out a bit and seems to incline back toward the house. The drip cap also seems to slightly incline toward the house. Additionally, when he removed the old window (the seal inside was beginning to droop), the top wood in the frame of the window was completely rotted and the interior drywall at the top of the window was damaged. Obviously the water had been sitting up top for a long time. Now that the frame was rebuilt, the window replaced (and an exterior aluminum wrapping around the exterior brick mould), and completely sealed, do you think we should be worried? We’re concerned that the rain will still get in but now that there’s spray foam sealant and composite boards in the frame, that the water may just stay locked in there without a way to escape. The only way we noticed it the first time was that the grout in the shower was wet after it rained. We notified the company today of our concerns and are awaiting a return phone call. We’re expecting heavy rains tonight so it should be interesting. Any input would be greatly appreciated. Thanks! Here’s something you may not know: When painting the exterior molding that holds a window into place, the paint should slightly overlap onto the glass. This may seem shocking as we typically do everything possible not to get paint on our windows. But the continuous membrane of the paint from the molding onto the glass creates a seal that is actually part of a moisture protection strategy. Professional painters and savvy DIYers already know this. Thanks for the well documented article, I want to fix up all my windows but don’t even know where to start. I think I identified some of the leaks as a problem of my sealant. Which, if that is the case, would be quite the easy fix. However, if it is the windows themselves or mis-sized runners then I may need to hire a professional. I have a leak in my downstairs ceiling. A contractor came to look at it and performed a leak test. He said the weep holes in my second-story window had been stuccoed over by a previous contractor. So he dug out the stucco and then taped the weep holes and then poured water in the inside window tract. Most of the water did not come out of the weep holes or remain in the tract. The water disappeared! The contractor says I need the entire window replaced. Is this true? Or can the window somehow be salvaged? Is there something else I can try, perhaps sealant or caulking, before I replace the entire window? Thank you for having such an informative site to reference. We get a serious leak between our combination storm windows and the interior double hung window, even when the storm window is tightly closed. It is like a faucet between the two windows. Please help!! Thank you!!! If the leak is at the top of the window, look at the building construction above the window. Send me a picture if you can. If water pools at he bottom, drill a few weep holes at the bottom of the storm window to allow drainage to the exterior. I have a leaking window problem. Water is leaking from top of window frame. I live in Naperville, do you consult and provide repair service as far as Naperville? If not could you provide a recommendation. Yes, I work in Naperville, IL and everywhere else in the US. But Naperville is particularly easy. Im in NJ so not sure you will still offer your expertise. I have sliding windows 15 years old and when it rains i get water in my window tracks, its settles there. I have to force towels in the track so that it absorbs most of the water in there. I know I need new windows but why is this happening? Also if its there in the track does this mean its getting down in the wall under the window? MOLD? Also when there is ice on the windows, when the ice melts it leaks inside again in the tracks? Thanks for anything at all you can suggest! Yes I work in NJ. Just got back from a week in Brooklyn. Water in the sliding door track is not in-and-of-itself considered a failure. If the water does not drain out, or if it penetrates frame joints or fastener holes, that is a failure. If water simply does not drain out, analyse what appears to be the intended drainage path and try to open it up. If you have stains to the interior finishes, water may be entering the building through frame joints and/or fastener holes, or bad exterior caulk. Hey, I had a friend of mine reference this article regarding the bad caulk around windows. I would recommend contacting your supplier and asking where they are sourcing it from. I know that Bostik (the company that supplies about 80% of the market with window sealants) had a massive recall a few years back. Many of the windows that had the seals break or fail were eligible for replacement at no cost to the homeowner. So if you’re looking at your new windows, try to see what adhesive or sealant was used.